A Beef Stroganoff with Smirnoff Vodka! The lovely people at Taste PR got in touch with us and offered us a sample of a couple of the Diageo products for us to knock some recipes out with. While I was scanning the product list, Smirnoff Vodka jumped out at me and I thought I could have some real fun with it. The intention is to create a 3 course meal with vodka being the theme but almost immediately after a bottle of Smirnoff Red Label appeared by courier and it dawned on me that I had made a bit of an error in judgement in choosing vodka as it seems to be a) flavourless, b) very strong and c) used in cocktails etc. as a flavour enhancer. My original idea was to make some really pretentious ‘deconstructed cocktails’ as puddings but I couldn’t find a way to use the vodka as a flavour ( I will be doing some vodka ice-cream later on but it won’t be the dominant flavour). The main event didn’t take a lot of planning, given that Smirnoff was originally distilled in Moscow it seemed obvious that the most famous Russian dish should be used to showcase Russia’s most famous drink. 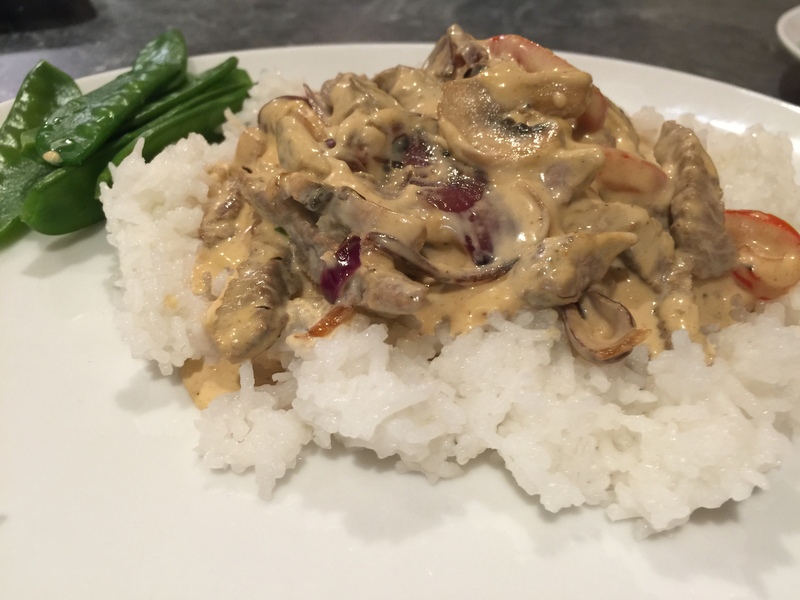 Beef Stroganoff, or if you want to really stretch a point.… Beef Smirganoff! As mentioned previously, Vodka is largely tasteless so I had to try and work out how to get it involved where it wouldn’t just be a case of pouring booze into a creamy sauce – Although vodka is an excellent emulsifier which is important when adding cream to a hot sauce. I used the stroganoff as an excuse to see how well vodka worked tenderising meat. The long and the short of it, pretty well! Steak – An equivalent amount for a stir-fry – you can economise on the cut because the marinade will help to tenderise it. Dijon Mustard – A teaspoon in the marinade and a big tablespoon in the sauce (or more if you like it with a bit more kick. Mushrooms, Onion and Peppers – Enough to bulk out the sauce. Double Cream – Depends how thick you want the sauce but approximately 80-100ml per person. 1) Take the shot of Smirnoff, ginger, garlic, half of the dijon and mix it up into a marinade. 2) Mix give the steak a thorough massaging with the marinade and leave for a couple of hours. That will be more than enough for the Smirnoff to get to work on the steak and make it lovely and tender. 3) Take the steak from the marinade, don’t worry if it has gone a horrible grey colour like this, it will still brown nicely. Save the marinade for pouring into the sauce later. 4) Flash fry in a really hot pan, you ideally want it to be rare because the sauce will continue cooking it if you put it in. 5) Sauté the peppers, onions and mushrooms in the beefy pan allowing to get some good colour on the peppers and onions. 6) Kill the heat and add the cream, paprika, salt, pepper and bring to a simmer, then add the mustard to taste. 7)Pour in the vodka and stir. This should add some shine to the creamy sauce and give it a bit of an edge. If you want to serve the steak well cooked, add it to the simmering sauce for a couple of minutes and serve ladled over rice or noodles. If you want the steak to be rare, lay it on the rice and then pour the sauce over. Please excuse the dodgy looking rice, Alyson was working late so it hung around a little while and got a touch sticky! If you enjoyed this recipe, why not try our Smirnoff Bloody Mary Spaghetti with Turkey Meatballs?